Marine oil disc filter is mainly used to remove water and mechanical impurities from fuel oil, lubricating oil and other mineral oil in marine diesel engine unit and land-used diesel generator unit of power station so as to reduce wear of the diesel engine and other machine, and prolong engine life. 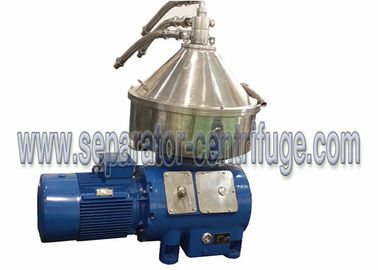 The model is also used to separate two unsolvable liquids with different specific gravity or remove small amount of solid particle from liquid.It is divided into 2phase solid-liquid separator and oi-water-impurity 3phase separator.They are workable in land and ship,we have the CCS certificate to certify its function and usage. There are different discharge types of the oils,manually,partial,fully discharged,variable discharge etc which depends on the different materials.commonly,we define the capacity as density of 0# diesel oil ,and we have a chart to help you find out the exact processing capacity of your needs. We are not only provide the single oil separator,but also the whole unit containing the pumps,valves,heats,pipes and so on. 1)How many kinds of the oil can you separate? 2)How can you select the suitable capacity? 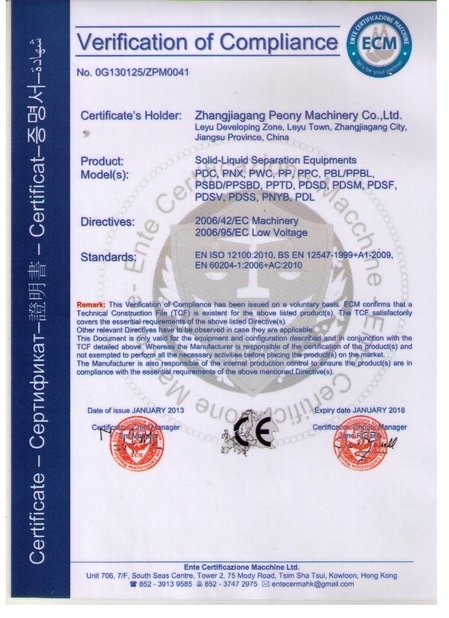 Different oil has different capacity, our 1500L, 2000L, 3000L, 4000L, 5000L, 6000L, 8000L ,10000L capacity is for the Marine diesel oil 0# as sample. It also depends on the viscidity, temperature, and for all the capacity model, we have an oil characteristic sheet to help our customer to find out what their oil is, and what capacity their oil belongs to. We have 3 types discharge means according to different material and customer's requirements, we have self cleaning model and manual cleaning model. 4)Will you help us to select the model? 5)Do you only have the single machine or the unit? 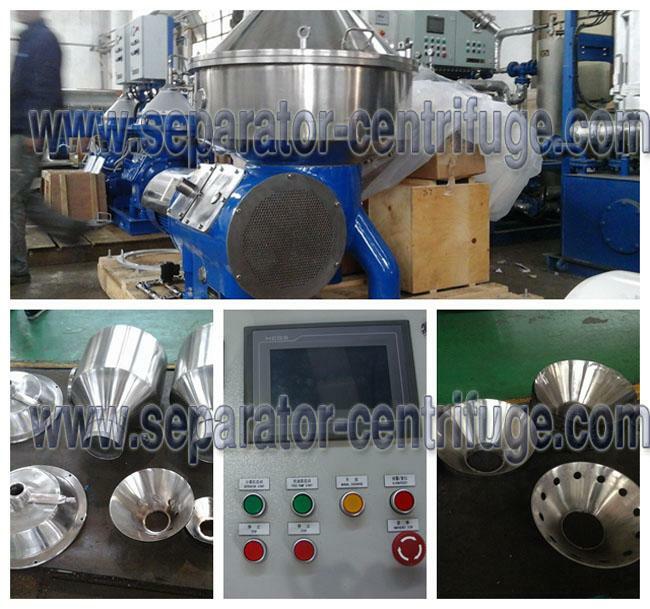 Disc separator is vertical centrifuge. The drum is installed on the upper side of the vertical shaft. Driven by the motor, it will rotate at a high speed through the gearing. Inside the drum there is a group of dish parts overlaying each other – disc. There is very small gap between the disc. Suspension (or emulsion) is fed into the drum through the inlet in the middle of the drum. When the suspension (or emulsion) flows through the gap between the disc, under the action of the centrifuge, the solid particles (or droplets) go down to the disc in the formation of sediment (or liquid layer). Along the disc surface, the sediment slides out of the disc and accumulates at the part with the largest diameter inside the drum. After the separation, the liquid is discharge out of the drum from the drain outlet. The role of the disc is to reduce the sediment distance of solid particles (or droplets) and enlarge the sediment area of the drum. 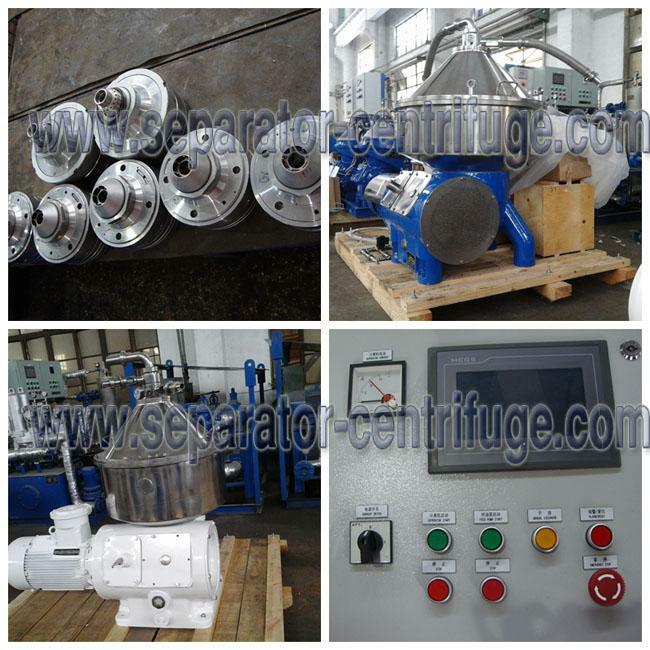 With the disc inside the drum, the capacity of the separator is improved greatly. The solid gathering inside the drum is manually removed by taking apart the drum after power off, or discharges from the drum through the slag-off part with the separator power on. 1. Mineral oil industry: purification of fuel and lubricating oil used on main engine for vessels, land diesel engine, power plants, etc. 2. Dairy Industry: clarification, purification and degreasing of fresh milk. 3. Vegetable oil industry: purification and clarification of palm oil, degumming, DE-soap, dehydration and dewaxing of refined vegetable oil. 4. Beverage products industry: clarification of beer, juice and beverage, extraction of plant protein and wastewater treatment, clarification of zymotic fluid of bio-engineering. 5. Starch industry: enrichment and classification of starch. 6. Pharmaceutical industry: purification or clarification during the extraction of agentia of antibiotics and biochemistry pharmacy, clarification of Chinese drugs medicament. 7. Chemical industry: chemicals purification or clarification. 8. Lanolin industry: extract and purify the lanolin from the scouring wastewater. 9. Latex industry: purification and concentration of natural rubber latex. 10. Others: such as recycling of laboratories, petroleum, coking, kaolin and pulp, electrolyte treatment, wastewater treatment, environmental protection, and animal and plant protein extraction, the extraction and refining of animal fat, separation of mixed fatty acids.